A camera works by opening its shutter for a certain time to let light hit the sensor or film. Motion blurs occur if the shutter is open too long, and the object moves far enough during the time. The Earth is taken entirely. The observer who takes the picture is in a stationary position in space. then, the maximum shutter speed where motion blur does not occur is 2.7 seconds. We’ll assume we are going to take a picture of the Earth with the resolution of 10000×10000, far higher than any camera in the market when this article was written. Earth’s diameter is 12742 km. If we were to take a picture of the Earth filling the entire frame, then from edge to edge is 12742 km, represented by 10000 pixels in the image. We can calculate a single pixel represents a maximum distance of 12742 km / 10000 pixel = 1.27 km/pixel. 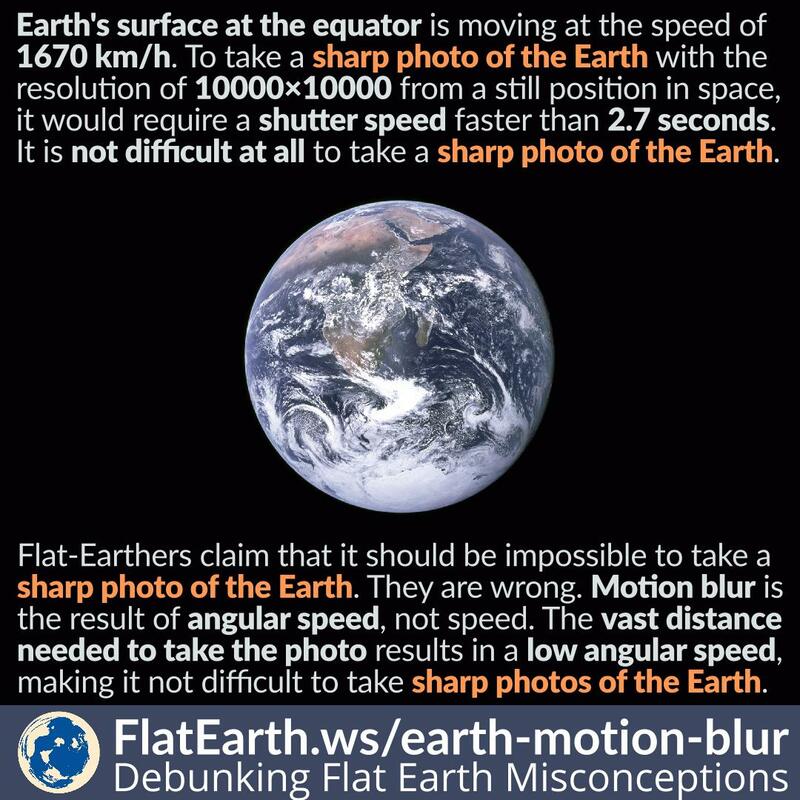 Motion blur will not occur if the shutter speed is not longer than the time it takes for the Earth to move 1.27 km. The Earth is moving at 1674 km/h close to the equator. Then the longest shutter speed required to keep the picture from having any blur due to Earth’s rotation is (1.27 km/pixel) / (1674 km/hour) = 2.7 seconds.